Advertisers and Buzz | Call For Free with Likiwi ! Diffuse your video ads on social networks ! Pixmania is one of the leading distributors of technology products (computers, household appliances,...) and Cultural Rights (DVDs, video games, books,...). The troublemakers of taste Michel & Augustin used Likiwi to promote "cow pots"! Michel has a green plant, a bike and much more on the head. Augustin has a Kangoo Blue, 4 baby seats and 1 puff. Pringles is a snack savory potatoes and a brand from Procter & Gamble. "First Brand World Botanical Beauty"
Laboratories of Plant Biology Yves Rocher were born in 1959 in Britain Gacilly. Why become an advertiser ? 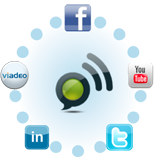 Boost your brand by distributing your video ads on social networks and very virals platforms. With Likiwi, your community is close to your hand. 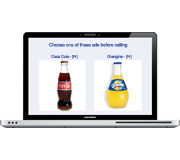 Likiwi broadcast your ads only to profiles that interest you and have selected your brand. You will be able to build a relationship with your clients. Our users choose to watch an advertisement from 2 preset before each call. It's your ads that will enable them to make free calls to landlines and mobiles! Your brand is valued and at the end of the video the user can visit your product.